Asian Beef and Prawn Salad | Is Life a Recipe? With an invite to my good friend and neighbour, Ben’s birthday, with his wife Jacelyn. I thought the honourable thing to do was to knock up a quick dish. What came from the Semi-Naked Chef was this absolute knock-out Asian Beef and Prawn Salad. I don’t mind saying this myself, but a few guests also said was so good too. Not bad hey. Very proud of myself in fact!!! 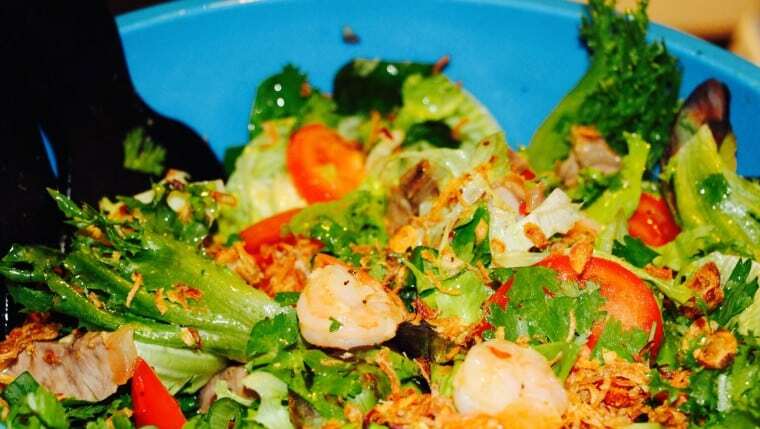 There are 4 elements to this Asian Beef and Prawn Salad; The dressing, the salad, the beef and the prawns. To make this easy let’s cover each off separately – as all you do when ready to serve is mix the 4. Nice. This will make a big old bowl full. 1 finely chopped chili padi. Put all these in a bowl and give it a good mix until the sugar has dissolved. Have a little taste. You want this sweet, sour, salty, and of course with some heat. This is one of the best dressings I have ever created to be honest – it’s sticky because of the plum sauce, so it coats everything it touches with this liquid, jammy, honey like consistency. Damn this was good. Pop this in the fridge until you are ready. A good pinch of salt and pepper. Drizzle the oil in a pan and get that hot. In go the prawns, butter, salt and pepper, and garlic. Cook these off on a high heat until the prawns are nicely cooked through and pink in colour. Off the heat and stand to one side to cool. Make sure the steaks are not cold. Take them from the fridge about 10 minutes before you’re ready, as you really should not cook meat from cold and you want it room temperature ideally. Rub the steaks with oil, and the salt and pepper on both sides. Take a good pan and heat that up with no oil. When nice and hot sling in the steaks and sear both sides – basically browning the meat, as the char gives the flavour. Then out of the pan and whack in an oven, set at 200 degrees for about 5-10 minutes depending how you like the meat – less time will give you a rarer cooked steak. I went for about 5 minutes and then left them covered with foil and a tea towel to rest so it retains the juices, and warm the meat in the middle. Again whilst resting just leave it to one side to cool as well. When it is cooled you want to slice the steaks as thinly as you can, almost paper thin is good. When the prawns and beef are cooled and after you have made your dressing, get the salad leaves a going. As once you have this you throw in the beef and prawns and pur of the dressing. Give it a toss or two to get that dressing coating and serve. And a handful or two of fried shallots for sprinkling on the top AFTER you have tossed the salad. And that as they say is that. A pretty simple, but VERY effective and super delicious Asian Beef and Prawn Salad. Again don’t take my word for it, the party goers were the critics and their statements say it all. You have to try this one!!! A little some the Semi-Naked Chef has knocked up for you. So go on try my Asian Beef and Prawn Salad ENJOY!!! No Replies to "Asian Beef and Prawn Salad"